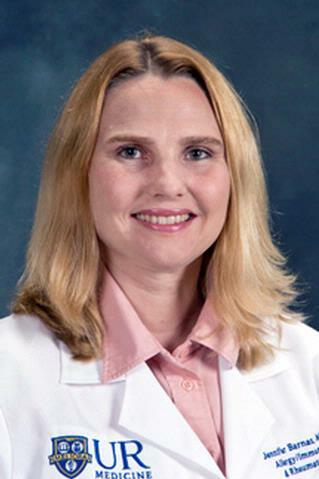 Dr. Jennifer L. Barnas practices both allergy/immunology and rheumatology specialties with medical board certification in internal medicine, allergy/immunology, and rheumatology. She sees patients in both rheumatology and allergy at the Lattimore Road office (585-486-0901 for rheumatology patients and 585-486-0930 for allergy/immunology patients). She is completing the ABIM research track at the University of Rochester. Her current research interests include the pathophysiology of systemic lupus with a focus on lupus nephritis. Research interests of Dr. Barnas include the cellular interactions within the renal microenvironment of lupus nephritis and how this contributes to the pathophysiology of human systemic lupus. Barnas, J. L.; Ritchlin, C. T.;. "Etiology and Pathogenesis of Psoriatic Arthritis". 2015; 41: 643-63. Simpson-Abelson, M. R.; Loyall, J. L.; Lehman, H. K.; Barnas, J. L.; Minderman, H.; O'Loughlin, K. L.; Wallace, P. K.; George, T. C.; Peng, P.; Kelleher, R. J., Jr.; Odunsi, K.; Bankert, R. B.;. "Human ovarian tumor ascites fluids rapidly and reversibly inhibit T cell receptor-induced NF-kappaB and NFAT signaling in tumor-associated T cells". 2013; 13: 14. Bankert, R. B.; Balu-Iyer, S. V.; Odunsi, K.; Shultz, L. D.; Kelleher, R. J., Jr.; Barnas, J. L.; Simpson-Abelson, M.; Parsons, R.; Yokota, S. J.;. "Humanized mouse model of ovarian cancer recapitulates patient solid tumor progression, ascites formation, and metastasis". 2011; 6: e24420.